The white pine weevil is considered the most destructive insect pest of Eastern White pine in North America. This species kills the terminal leader primarily of Eastern White pine. Colorado Blue, Norway, and Serbian spruces, Scots, Red, Pitch, Jack, and Austrian pines, and occasionally Douglas fir are also attacked. Trees become susceptible to injury when they reach a height of about three feet. White pine weevil infests both natural stands and managed landscape trees. The white pine weevil prefers to attack trees exposed to direct sunlight. Adults spend the winter in the leaf litter under or near host trees. On warm spring days they fly or crawl to the leaders of suitable hosts, usually during the period from mid-March through April. Most feeding by adults is done within 25 cm of the terminal buds. From mid-April through early May, females mate and each deposits one to five eggs in feeding wounds. Hundreds of eggs may be deposited in one terminal leader. The eggs hatch in about seven days. When the terminal is heavily infested, larvae feed side by side in a ring encircling the stem. They feed downward on the inner bark of the leader. Larvae reach maturity in mid- to late July and pupate in the infested terminal. The pupal chambers called “chip cocoons” are filled with shredded wood and can be found inside the terminal at this time. Adults emerge in 10 to 15 days through small holes at the base of the dead terminal of the host plant, usually in late July and August. During this time feeding by adults is not considered important since little is done before they enter the leaf litter to overwinter. 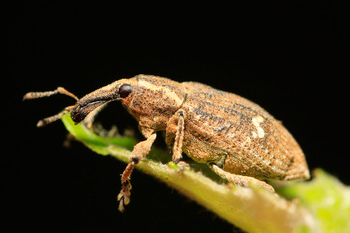 The white pine weevil has one generation per year. Injury to Eastern White pine and some species of spruce is usually confined to the previous year's terminal leader. Damage on Scots pine and Colorado Blue and Serbian spruces often extends downward through two or three year's growth. The good news is infested trees are seldom killed.